A competitive examination for recruitment of candidates as Special Class Apprentices in Mechanical Department of Indian Railways is held by the Union Public Service Commission in accordance with the Rules published by the Ministry of Railways (Railway Board). UPSC SCRA Exam Pattern helps you in time management and to prepare for the subjects in a better way which surely helps you in final preliminary exam.The Examination shall be conducted according to the following plan. 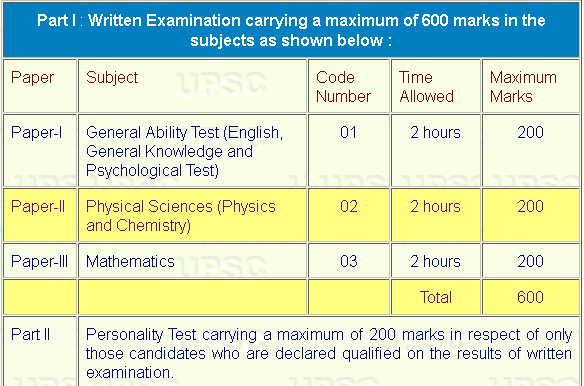 Part I: Written Examination carrying a maximum of 600 marks in the subjects as shown below. The UPSC SCRA Exam consists of three papers – PAPER – I, Paper – II & Paper – III. Each Paper has equal marks and time. Part II: Personality Test carrying a maximum of 200 marks in respect of only those candidates who are declared qualified on the results of Written Examination. The papers in all the subjects will consist of Objective (Multiple Choice Answer) Type questions only. The Question Papers (Test Booklets) will be set in English only. Candidates must write the answers in their own hand. In no circumstances, will they be allowed the help of a scribe to write the answers for them. Blind candidates will, however, be allowed to write the examination with the help of a scribe. An extra time of 20 minutes for each paper will be permitted to the blind candidates for papers (Objective type) of duration two hours each. You may also like to download UPSC SCRA Exam Previous year question paper with answer key. Since then, the few admission seats for one of the country’s first engineering college have always been hotly contested. Thus UPSC SCRA Exam Previous Year Question Paper with answer key can definitely be very productive for the students because it helps in knowing about the pattern as well as the kind of questions that can be asked. Best Of Luck for Your Selection and Hope UPSC SCRA Exam Pattern helps you a lot !!! !